Hair comes in different lengths, textures and colours. Yet, just about everyone – no matter what kind of hair they have – falls prey to dandruff problem at some point of time. Dandruff in hair is attributed to many different causes, ranging from common to the not-so-common. If you have been noticing those dry white flakes of skin on your shoulders. Collar, pillow or hairbrush, you may worry that you have dandruff. It can be itchy and embarrassing. If you eat food high in saturated and transfats, your sebaceous glands produce more oil which can give rise to dandruff or make dandruff worse. If you are using hair sprays, styling gels and creams on a regular basis, it can potentially generate a worsen dandruff problem. These products build up a layer of oil on yours scalp and hair leading to dandruff. Irregular or inappropriate washing of hair can build up sebum on the scalp resulting in dandruff. Stress is another cause that can aggravate or even worsen dandruff. So, it is more difficult for your body to deal with the presence of Malassezia Globosa-an-ever-present microbe on your scalp. It leads to scalp irritation and dandruff. The problem worsens if your scalp becomes itchy and you scratch it frequently. Inappropriate hair products and treatments available over the counter may lead to severe cases of dandruff. If you do not comb or brush your hair regularly, it may increase the risk of dandruff. Certain skin conditions like eczema and psoriasis and certain medical conditions like Parkinson’s disease can cause dandruff in your scalp. Load up on vitamin B-rich food like oatmeal, egg, banana and rice. Eat healthier monounsaturated fatty acids like avocados, olives, nuts and sesame oil. Avoiding styling products like hair sprays and gels can help prevent dandruff. Shampoo your hair more frequently to keep your scalp sebum-free/oil-free. You may opt for shampoos containing tea tree oil for optimum benefit. It is also very important to rinse shampoo thoroughly otherwise leftover residue can become the feeding ground of dandruff. Do your scalp a favour and try to be calm and relaxed. Do meditation, yoga, walk or exercise. These are potent stress-busters. Incorporate these techniques in your daily lifestyle. Expose your scalp to sunlight for 10-15 minutes daily. It can be helpful. 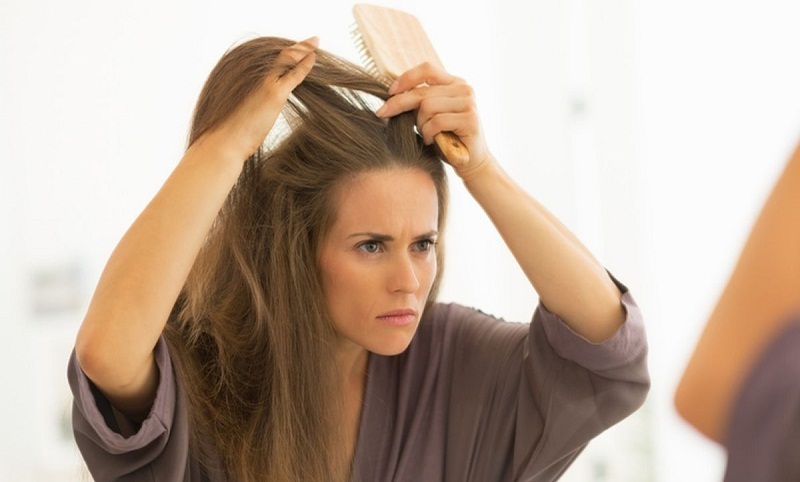 Enough hair brushing may reduce the risk of dandruff. Soak two teaspoons fenugreek seeds in half cup of water overnight. In the morning, drain excess water and make a paste of softened fenugreek seeds in a food processor. Apply this paste on your scalp. Let it sit there for an hour. Rinse off with a mild shampoo. Wet your scalp well. Rub baking soda on your scalp. Wash thoroughly with a mild shampoo after an hour. Mix a tablespoon of apple cider vinegar with a tablespoon of water. Apply it on your scalp and give a massage for 10 to 15 minutes. Rinse off properly. Give a good massage to your scalp with tea tree oil. Leave it for an hour. Use a mild shampoo to rinse off. Apply curd on your scalp. Let it sit there for an hour or so. Rinse off thoroughly with a mild shampoo. Make a paste of fresh neem leaves. Apply this paste on your scalp and leave for an hour. Rinse off with water. You can also boil neem paste with coconut oil. When oil turns green, turn off flame. Let it cool at room temperature. Sieve it and store in a bottle. Apply this oil on your scalp before bed and leave overnight. Rinse off with a mild shampoo the next morning. Make a hair pack containing soaked fuller earth and little honey and lemon juice. Apply this paste on your scalp and hair. Leave for 30 minutes. Rinse off with a mild shampoo. Heat coconut oil. Add few drops of lemon juice and mix well. Apply it on your scalp and leave for few minutes. Wash off using a mild shampoo. Apply aloe Vera pulp on your scalp and hair. Wash off after an hour. Make garlic paste. You may also add little ginger paste and honey in it. Apply it on your scalp and wash off after an hour with a mild shampoo. Dandruff is a chronic condition that occurs when the scalp becomes dry or greasy and produces white flakes of dead skin. Give these natural remedies a try and get rid of dandruff naturally.